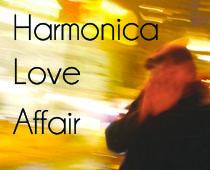 The most comprehensive collection of harmonica music on the internet. Son of Dave was once Benjamin Darvill of the Crash Test Dummies but he was reborn as a harmonica virtuoso and beatbox musician extraordinaire. He inspires me and someday I will own a loop pedal thanks to him. As to the matter of his musical genius, I present the following video, wherein he performs an absolutely inspired cover of Sam and the Womp‘s Bom Bom. I'm a woodworker by day and a musician by night, a blogger on the weekends and an artist when I can find the time.